Google's Nexus 7 tablet can now be ordered on more retail websites worldwide, but so far the less expensive $199 model remains exclusive to Google's Play online store, according to current listings. Retailers such as Staples, B&H Photo and Video, and Best Buy Canada have listed only the pricier Nexus 7 model with 16GB of storage, which starts at $249 depending on the region. The stores have not listed the cheaper 8GB model, which is available on the Google Play online store for $199. Google late last month at its developer conference announced the Nexus 7 with 8GB and 16GB of storage. The tablet, made with Asus, has Google's latest Android 4.1 operating system code-named Jelly Bean and a quad-core Nvidia Tegra 3 processor. The 16GB model is priced at $249 on the Google Play store, with shipping beginning in mid-July. The same tablet is also listed for on Staples' website for $249, with shipping scheduled to start Thursday to next Tuesday. The tablet has attracted publicity partly for its features, but the $199 price also attracted many buyers who wanted to check out Android. The 8GB tablet is the most feature-packed in the sub-$200 price range, but at $249 the Nexus 7 starts competing on price and features with tablets like Samsung's Galaxy Tab 2 with a 7.0 inch screen. The $199 price point is critical to attract buyers to Nexus 7 and Google, which is looking to catch up with Apple, said Bob O'Donnell, program vice president for client and displays research at IDC. 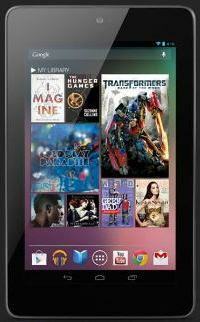 A $199 price boosted the sales of Amazon's Kindle Fire, which is based on a customized version of Android. The sales of Google's $199 tablet may not be hurt by exclusivity to the Google Play store, but wider availability could certainly expand the tablet's market presence, O'Donnell said. A 16GB Nexus 7 is listed on B&H Photo and Video's website for $249, and is scheduled to ship on Aug. 15. The same tablet was listed at the same price on J&R's website and a copy of the page is available in Google's cache, but the original page has been pulled off the website. The 16GB tablet is priced at C$259 (US$253) on Best Buy Canada's website, which says the tablet will reach the warehouse on Aug. 10. The tablet is available at the same price on Futureshop Canada's website. A 16GB Nexus 7 is listed for Â£199 (US$308) on Carphone Warehouse U.K.'s website, with the product "coming soon." The tablet weighs less than one pound, with claimed battery life of up to nine hours on video playback and 300 hours on standby. Other features include a front-facing camera, Wi-Fi, Bluetooth and NFC (near-field communication). The device's new OS is an improvement over its predecessor, Android 4.0, which is found on many smartphones and tablets today. The new OS features an expanded notification system, improved user interface, additional language support, better touch features, support for more multimedia file formats and the ability to share more files directly via Bluetooth.